If you like veggie chili, I can't imagine you not liking this dish. It's another winner in TJ's "Indian Fare" line. At a mere $1.99, this product's an incredible value in my opinion. It's tomato-based, with some kidney beans, lentils, and subtle spices. It goes great with rice, and I'm certain it would pair up nicely with Indian naan bread. It's not particularly chunky other than the beans, and unlike other veggie chilis, you won't find big pieces of tomatoes or other vegetables, but the lentils add a welcome heartiness that adequately fills that void. The box suggests using it as a burrito filling, in case you're going for that "Indi-Mex" vibe. And I think it would work fine in any context you might use plain old American chili, too. You could put it on baked potatoes, create an interesting dish of international chili fries, or make your own Indian-American chili dog. But at least part of the fun of dishes like this one is experiencing a small taste of another culture. You can be adventurous without breaking the bank at a fancy Indian restaurant. 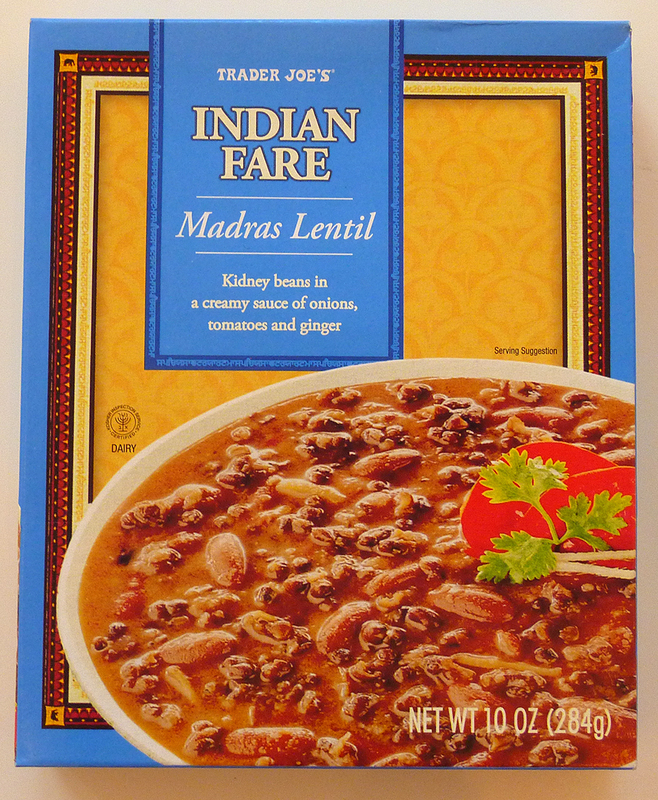 Apparently, Madras Lentil is also known as Dal Makhni, and it's usually "cooked on special occasions," according to the packaging. Click here to take a gander at other Indian-inspired product reviews from the WG@TJ's gang. Like the Punjab Choley, this product requires no refrigeration, and like the Indian "hot pockets," it can be prepared in the microwave. It is, of course, vegetarian, but not vegan, as it does contain some cream and butter. It's not as hot as I would have liked it to be, but I guess not every Indian dish is supposed to be a spice-fest. Considering the low cost, the ease of preparation, and the no-maintenance shelf-stability, this is one of the most hassle-free items we've come across at TJ's—or anywhere for that matter. Sonia and I are both impressed. 4 stars from each of us. To see the prepared product close up, check out our video review on YouTube. I love the Tasty Bites company version of this from Costco. I guess now I can get it at TJs. The ingredients look the same. Woohoo! People commented on the Facebook page about the Tasty Bites brand. Trader Joe probably uses their product and packages it differently. But somehow, TJ's seems to sell it for even cheaper than Costco in some places! 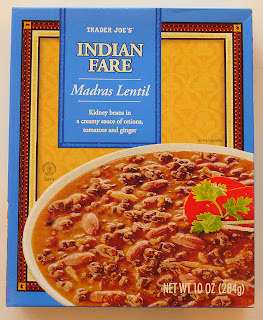 Yes, the Madras Lentil is one of my TJ's faves - I try to always have a package of it around.